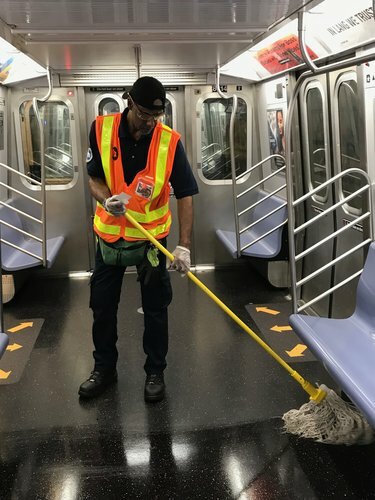 NYCT officials informed Local 100 leadership in December that it was hiring private companies for a pilot program to “deep clean” up 100 subway stations under the Subway Action Plan. Since these companies would use new equipment and products, NYCT claimed this was not a contract violation. Local 100 could have filed a legal challenge with an arbitrator – but that has risks. Pressure from Local 100 also forced transit officials to also state publicly at an MTA committee meeting that Local 100 is not losing any work. Lets’ go to the videotape: Both statements from NYCT President Byford and Acting MTA Chair Ferrer are available on our YouTube channel. “I’m very proud of our transit cleaners...and ultimately this is their work. There’s no question here... We’re not taking that work away. What we’re doing is embracing or capturing, harnessing if you will, the skills and methodologies, the processes and products that private sector contractors can bring, from which we can learn.